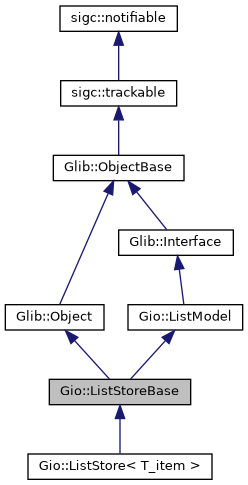 A simple implementation of Gio::ListModel that stores all items in memory. The templated subclass ListStore<> provides better compile-time type safety. It provides insertions, deletions, and lookups in logarithmic time with a fast path for the common case of iterating the list linearly. A slot that will be called to compare two items. item must be of type ListStore::property_item_type(). This function takes a ref on item. Use g_list_store_splice() to append multiple items at the same time efficiently. Inserts item into store at position. item must be of type ListStore::property_item_type() or derived from it. position must be smaller than the length of the list, or equal to it to append. Use g_list_store_splice() to insert multiple items at the same time efficiently. position The position at which to insert the new item. Inserts item into store at a position to be determined by the slot. The list must already be sorted before calling this function or the result is undefined. Usually you would approach this by only ever inserting items by way of this function. slot Pairwise comparison function for sorting. The position at which item was inserted. The type of items contained in this list store. Items must be subclasses of Object. Removes the item from store that is at position. position must be smaller than the current length of the list. Use g_list_store_splice() to remove multiple items at the same time efficiently. position The position of the item that is to be removed. Removes all items from store. Sort the items in store according to slot. Removes n_removals items and adds additions.size() items. additions must contain items of type property_item_type() or derived from it. Empty RefPtr is not permitted. This function is more efficient than insert() and remove(), because it only emits ListModel::signal_items_changed() once for the change. The parameters position and n_removals must be correct (i.e. position + n_removals must be less than or equal to the length of the list at the time this function is called). position The position at which to make the change. n_removals The number of items to remove. additions The items to add.